The next morning, Minho wakes Thomas before dawn and shows him inside a locked room in the Homestead where he gives him running shoes, a wristwatch, and other running gear. Minho says that over time they’ve gotten all this running gear by placing notes with requests for stuff in the Box. The next time the Box arrives, the Creators would include some of the supplies they had requested. Since the Creators supply the Gladers with this gear, they must not be totally evil. This scene should make the reader consider why the Creators would put a bunch of teens in a Maze and then give them the resources to get out. Perhaps they are studying something about human nature: will teenagers put in dire situations form a functioning society capable of finding an escape to the Maze or will they merely descend into chaos? Minho shows Thomas a secret trapdoor in the room which leads to another room where they keep weapons like knives, swords, and spears. Minho says that they keep these weapons hidden so that people like Gally cannot get to them. At first, the weapons make Thomas excited, but then he realizes that they only need weapons because they may one day need to fight off the Grievers. This thought replaces his excitement with fear. Thomas takes a couple of knives and then follows Minho to the Map Room, which is the concrete building with the steering wheel door. Here, the weapons undermine the appearance of the tranquility in the Glade. Since the weapons are physically beneath the Glade, they symbolically evoke all the violence (like the ritual sacrifice of Ben) that lies below the Glade’s surface. These weapons suggest that, at any moment, the Glade could erupt in extreme violence. In the Map Room, Minho draws Thomas a map of the Maze. First he draws a large square that fills up the entire page. Within that square, he draws three rows each consisting of three squares of the same size, nine squares in all. He labels the middle square “The Glade.” Starting from the upper left hand corner and moving clockwise, he labels the rest of the squares one through eight. Minho says that there are Doors just like the ones that at the entrance to the Maze that lead into Sections One, Three, Five and Seven. Although the location of the Doors does not change, the pathways leading up to them do. With all of its twists, turns, and dead-ends, the Maze appears absolutely chaotic to the Runners. But a map of the Maze reveals certain unchanging constants like the position of the doors and the number of sections. The Maze, therefore, has an order and logic not immediately apparent. In contrast, the weapons below the Homestead reveal that the Glade is more violent and chaotic than it appears on the surface. Minho explains that they have eight Runners, one for each Section. Although they have never found an exit out of any of the Sections, Minho says that they have learned that the walls repeat the same pattern of shifting every month. Minho also admits that the Maze is incredibly discouraging, but agrees with Thomas when Thomas says that they can’t give up until they find an exit. Minho tells Thomas that he’ll now take him through his first run through the Maze. Again, the Maze appears more ordered than it seemed. The walls don’t shift randomly, but instead follow a very specific pattern that repeats itself on a monthly basis. 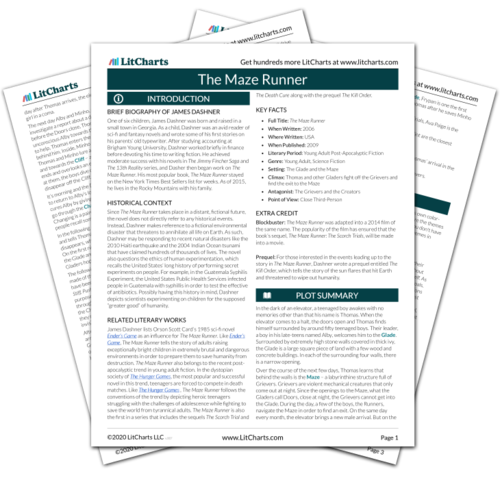 As a result of this new information, the Glade and the Maze don’t seem that different after all: they both consist of violent chaos and structured order. Plaue, Ethan. "The Maze Runner Chapter 32." LitCharts. LitCharts LLC, 22 Jul 2015. Web. 18 Apr 2019. Plaue, Ethan. "The Maze Runner Chapter 32." LitCharts LLC, July 22, 2015. 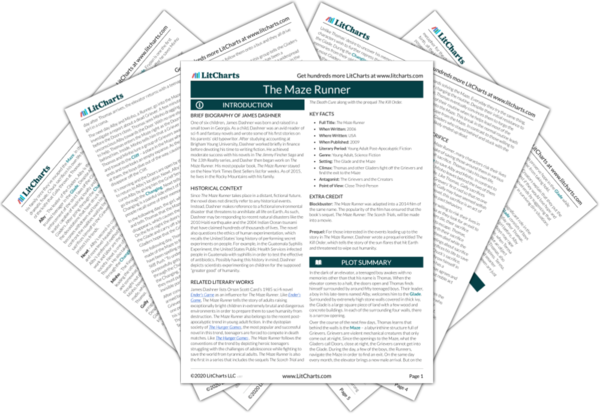 Retrieved April 18, 2019. https://www.litcharts.com/lit/the-maze-runner/chapter-32.